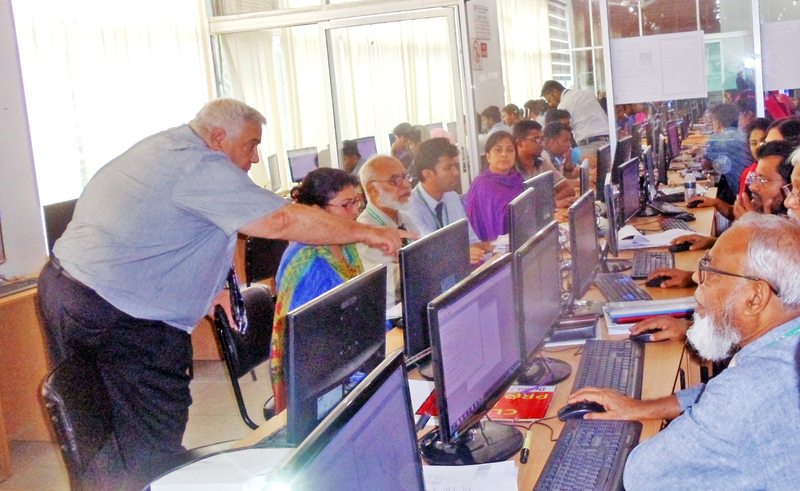 Thomas Sallee recently returned from his second trip to Bangladesh, where he built the statistical analysis skills of faculty from Jessore University of Science and Technology and International University of Business Agriculture and Technology in order for them to conduct improved, advanced agricultural research. He shares his thoughts below on the differences and similarities between his two trips to Bangladesh. My second visit to Bangladesh was somewhat different from my first trip. This time it was during the monsoon season which came early this year. It rained just about every day while I was in Dhaka, although mostly at night and in the early morning so I never got soaking wet. Also, my hosts were very considerate and held umbrellas for me and loaded me into vehicles under overhangs or covers. Luckily, none of the areas where I needed to visit were flooded although some parts of the city did experience inundated streets. Other parts of the country weren’t as fortunate. Heavy rains further upstream in India and Nepal along with locally severe rains caused extensive flooding in the eastern part of the country. The people I spoke with endured this with an optimistic resiliency based on the fact that they had seen this year after year and had always come through it and prospered. In Dhaka, I provided some training at the International University of Business Agriculture and Technology (IUBAT). This University, founded in 1991, was the first private university in Bangladesh. I also presented training at Jessore University of Science and Technology (JUST), a newer public university, founded in 2007. The rains continued as I traveled to Jessore. Again, my hosts graciously arranged to keep me dry and comfortable. I saw jute being grown, a new experience for me. Jute is a long, soft, shiny vegetable fiber that can be spun into coarse, strong threads. At one time jute was a major export crop for Bangladesh, but declined as a significant crop as plastics took over the bag and rope market. Today, as the world tries to reduce its dependence on petroleum products, there has been a small revival in jute production. 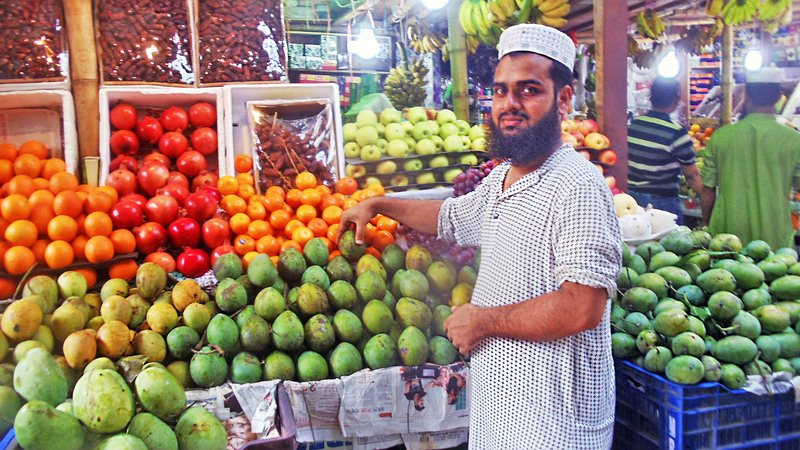 Another difference from my previous visit was that mangoes and jackfruit were in season. Again, my hosts were diligent in providing for me and I had plenty of delicious fresh fruit. I didn’t know there was such an assortment of mangoes. The inside of each variety has a unique color ranging from light yellow to dark gold. The flavors are also quite different. I ate a lot of mango and finally decided I couldn’t pick a favorite. They were all delicious. I also ate a lot of fresh jackfruit, which is nearly impossible to find back home. I didn’t know that the seeds of the jackfruit could be prepared and eaten several different ways. I had some that had been roasted and it reminded me of eating unsalted roasted peanuts. Since there were more than 50 faculty members attending our workshops, we had decided to divide them into two groups- senior professors, and junior professors and lecturers. We began our training with the senior faculty first. I was overwhelmed and touched by their sincerity and desire to learn new teaching techniques and strategies even though many of them had been working with students for decades. They posed very thoughtful questions and shared concerns about discipline and lack of motivation among students. They eagerly participated in group activities to seek collaborative solutions. We engaged in spirited discussions on modern teaching techniques and they were very responsive to the ideas and concepts we discussed regarding curriculum development starting from student, course, and program assessment to establishing course objectives, updating syllabi, creating student learning outcomes, designing multiple measures for evaluating student success, and designing and developing effective instructional techniques which don’t rely entirely on lectures. The junior faculty and lecturers were equally enthusiastic to ‘Get it right’ at the beginning of their teaching careers. I was deeply impressed by the knowledge and passion of the Enugu State Polytechnic College faculty to examine their own skills and capacity as teachers rather than placing all the responsibility and burden of learning on their students. I also had an opportunity to discuss some of the challenges faced by female faculty members. Once again, their knowledge, commitment to their students, and desire for lifelong learning were outstanding. 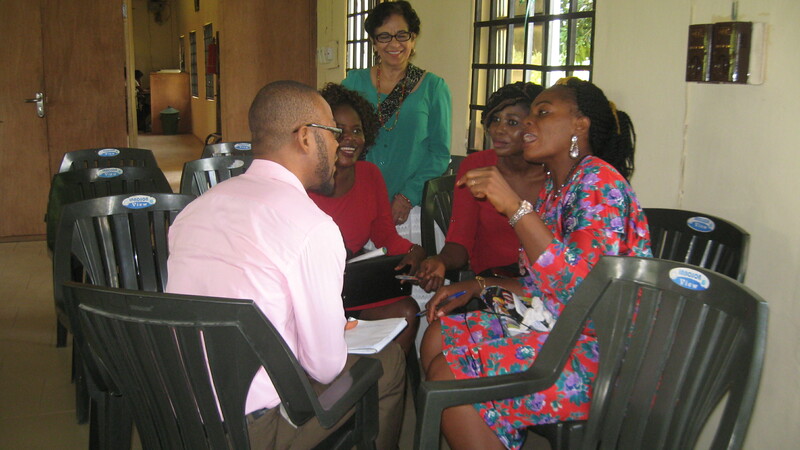 By the conclusion of the training, participants were already sharing alternative methods of instruction and planning steps for implementation. One group decided to start a Toastmasters chapter in Enugu in order to enhance their own and their students’ confidence and communication skills. In addition, Dr. Okonkwo created a planning committee to update the instructional curriculum based on our recommendations. This committee was comprised of faculty participants. As on previous assignments, I was deeply touched by the warm hospitality of our hosts. Dr. Ajibo and his office staff fed us tea and lunch every day. They ensured that we were provided with everything we needed to succeed in our work. At the conclusion of the training, Dr. Moses Okonkwo, the Regent of the college and his wife, Lady Okonkwo organized a magical ceremony with cultural dances (performed by students) accompanied with refreshments, and farewells. At present, I remain in touch with participants and they keep me informed of their progress resulting from the training Dr. Haskell and I provided them. More than that, I am gratified that there are committed and hardworking teachers who are taking proactive steps to shape the future of their students and their country. Finally, A heartfelt “Thank You” to Michael Bassey, Country Director, Winrock International F2F and AET Nigeria, and to Darla Embry, Program Associate, Winrock International, Little Rock, Arkansas. Without them, none of these rewarding experiences where I have gained more from the trainees than have given them would be possible. This week’s blog features, Dr. Cheng-Sheng Lee, Executive Director of the Center for Tropical and Subtropical Aquaculture, an organization jointly administered by the Oceanic Institute and the University of Hawaii. He recently returned from a volunteer assignment in Myanmar where he provided training to catfish farmers and breeders at the Myanmar Fisheries Federation office and a practical training at Yangon University in collaboration with the the USAID-funded Developing a Sustainable Seafood Industry Infrastructure project in Myanmar. 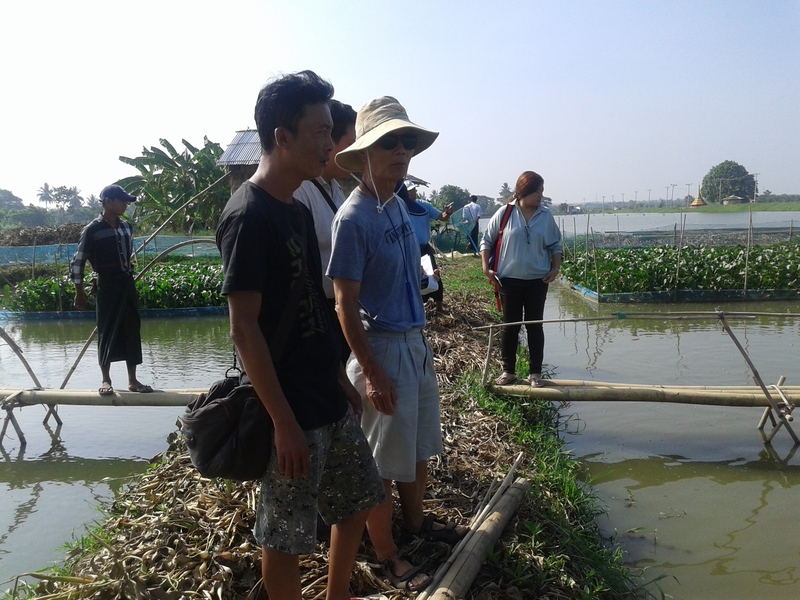 Dr. Lee in Twante Township, conducting an initial field visit of the catfish farms prior to training. As we celebrate Independence Day in the US, Winrock’s Volunteer Programs team is thinking about one of the freedoms that we enjoy as Americans: the freedom to give back. Volunteerism is not a requirement, yet many Americans actively choose to serve in their own communities, by tutoring local schoolchildren, participating in city clean-ups, mentoring young professionals, volunteering at community events, delivering food to the elderly, and much more. Volunteer service brings people together. Some US citizens even employ their skills to volunteer in other countries, lending their technical expertise to a variety of beneficiaries, from smallholder farmers to agricultural training centers, women’s cooperatives, and youth groups. In addition to promoting sustainable economic growth and agricultural development worldwide, the USAID Farmer-to-Farmer (F2F) program that Winrock very proudly implements also encourages people-to-people exchange. 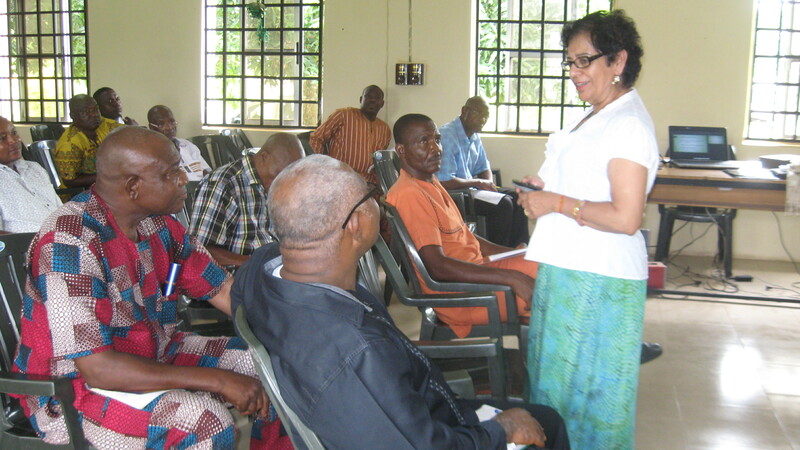 So far this year, Winrock has sent 108 F2F volunteers to Nigeria, Guinea, Senegal, Mali, Nepal, Myanmar, and Bangladesh. By connecting with people across borders, F2F volunteers have the opportunity to promote international goodwill and spread American values like liberty, equality, and determination. We are grateful to all of our volunteers, including those who have chosen to spend this 4th of July giving back around the world.